FULTON MARKET— Ballast Point has applied for the liquor license for its brewpub at 210 N. Green Street. There’s no update on an opening date for the project, so stay tuned. JEFFERSON PARK— There’s a new coffee shop/bar coming to The Jeff. It’s called Weston’s Coffee & Tap Co. They’re gearing up for a mid-December opening at 4872 N. Milwaukee Avenue. 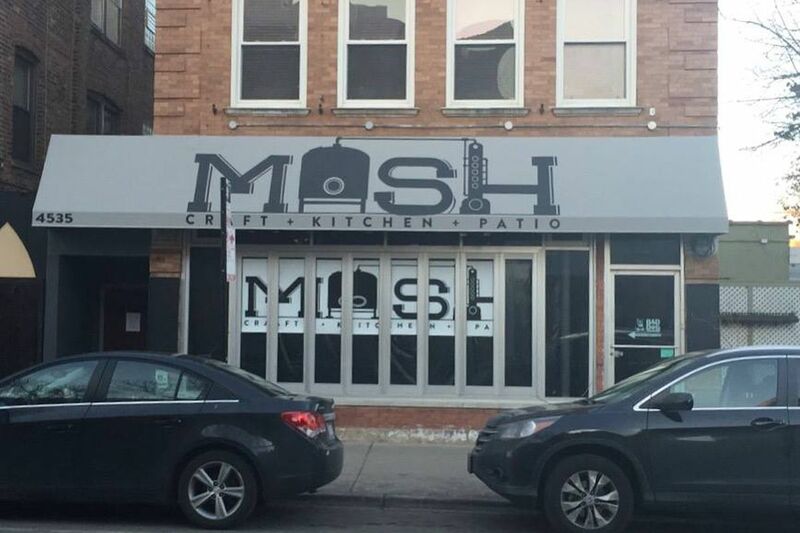 LINCOLN SQUARE— There appears to some activity at the former Mash/Bad Dog Tavern space at 4535 N. Lincoln Avenue. There’s signage for Flock Together with a winter 2017 projected opening. Apparently, its from the same ownership group as Gather, the Lincoln Square restaurant down the street. THE LOOP— Capital One Cafe is opening another location, according to Crain’s. They’re opening at 100 S. State Street. PRINTERS ROW— There’s a liquor license for Taco Madre at 823 S. State Street. They have six suburban locations. RIVER WEST— Here’s an update on the new burger spot from the owners for Piccolo Sogno. Chicago reported the Maillard Tavern will open in December at 494 N. Milwaukee Avenue. STREETERVILLE— Carson’s, The Place For Ribs has applied for a liquor license for its space at 465 E. Illinois Street. It’s the chain’s first new restaurant in decades and there’s speculation that it will replace the flagship location in River North. WICKER PARK— Remember the project going into the Beachwood Inn that was snarled after the building collapsed at the corner of Beach and Wood? Chef Brian Jupiter said things are on track for an early 2018 opening for Mae Bell Tavern and Grocery, 1415 N. State Street. Jupiter is the chef at Frontier in West Town. The restaurant is part of the Pioneer Tavern Group, which counts Frontier and Lottie’s Pub as part of its holdings. WESTERN SPRINGS— Salty Fig Kitchen & Pantry is hiring. They’re a new spot in the suburbs. It’s a 60-seat restaurant at 909 W. Burlington Road, reported the Tribune. ALBANY PARK— Surge is a new billiards bar and café taking over the Marie’s Golden Cue spot at 3241 W. Montrose Avenue. The owner also ran Pressure Billiards in Edgewater. Surge should open this month, according to a rep.
ANDERSONVILLE— There’s construction permits and signs for It’s Greek to U Grill at 5449 N. Clark Street. It’s replacing Sunshine Cafe. GOLD COAST— There’s a breakfast spot replacing Vora, the pan-Asian restaurant that closed in January at 1028 N. Clark Street. There are sign for Sunny Side Up Cafe. PRINTER’S ROW— There’s a new all-day cafe/bar coming to the former Blackie’s space at 755 S. Clark Street. It’s called Half Sour and the restaurant’s Instagram feed shows chicken wings, bagels, breakfast, and more. Sloopin’ was the first to notice. RAVENSWOOD MANOR— Baker Miller Hot Bar is no more, but there’s already a new tenant. The owners of Steingold’s of Chicago, the North Center deli that opened in August plan on opening a mini version of their restaurant. It’s called Steingold’s Station, according to theTribune. It should open later in November at 4642 N. Francisco Avenue. RIVER NORTH— Brendan Sodikoff’s upcoming Japanese restaurant, Radio Anago, is built out, Sodikoff said. The restaurant, 226 W. Kinzie Street, is next to his first restaurant — Gilt Bar — could open in January, Sodikoff added. They’re just waiting to finish one more area in the space. WICKER PARK— Tavern closed last month at the corner of Damen/North/Milwaukee. It will be replaced by a massive bank with Capital One Cafe, reported DNAinfo. BUCKTOWN/LOGAN SQUARE— It’s not peak frozen treat time, but there’s a banner proclaiming that Ava’s Italian Ice will open soon at 1814 N. Western Avenue. BUCKTOWN— There’s movement at the Red Beard Coffee Traders site at 1948 W. North Avenue. The boards have come down and a mostly built space is partially visible through the windows but there’s still no indication to when it will open. Red Beard has been the subject of The Profit, the Marcus Lemonis TV show. The site was also pegged for a Bow Truss coffee locationbefore Lemonis and Bow Truss founder Phil Tadros had a falling out. WEST TOWN— Across the street from darling neighborhood steakhouse Boeufhaus, there appears to be a new restaurant opening that features Latin-inspired rice bowls. It’s simply called Rice Bowl over at 1021 N. Western Avenue. FULTON MAKRET— Punch Bowl Social, which already has a suburban location in Schaumburg, has finally received its liquor license for its Chicago location. The gaming venue, restaurant and bar is going in at 832 W. Fulton Market inside a space once pegged for Brooklyn Bowl. LOGAN SQUARE— It’s been more than two months since Buzz Killer Espresso vacated its Bucktown location as ownership prepared moved to prepare to open a new coffee shop at 2779 N. Milwaukee Avenue. A Facebook post indicates they’ll soon announce an opening date. Check out photos of the new space below. THE LOOP— Gibsons Italia, the first new restaurant for the venerable independent chain in 12 years, should open on Monday, according to a spokeswoman. It’ll hold “practice” services on Friday and Saturday inside the new River Point Building at 233 N. Canal Street. The multilevel restaurant features an upstairs bar with a retractable roof. THE LOOP— Though it won’t be completed until 2019, workers began construction on the new shopping center at The Willis Tower, 233 S. Wacker Drive. The new tenants include Shake Shack, reported Curbed Chicago. Fine- and casual-dining options, as well as bars, will be part of the project. NORTH CENTER— Giant-sized sushi rolls are an increasingly popular item in Chicago. They’ve gone by many names, most commonly “sushi burritos” — a cousin of trendy poke bowls. Now an upcoming North Center restaurant is using some clever marketing to try to create its own niche. Poke Burrito should open in November at 4301 N. Lincoln Avenue, according to DNAinfo. It replaces Pockets, another concept that took an “ethnic” concept (Indian chapati) and stuffed it. PORTAGE PARK— Workers have erected the walls over at the Culver’s site at 4939 W. Irving Park Road. Ald. (45th) John Arena’s office posted photos of the site. The butter burgers are coming soon. RIVER NORTH— The Stefanis are almost ready to unveil their new pizza spot. Bar Cargo should open on Nov. 1 at 605 N. Wells Street, according to a rep. For a primer on their Roman-style pies, check out this story. RIVER NORTH— Point & Feather, the River North dart bar going into the Mercer 113 space at 113 W. Hubbard Street, should open on Nov. 3, according to a rep.
SOUTH LOOP— Dollop Coffee is working on another expansion. Ownership has plans to open a cafe at 801 S. Financial Place, according to a permit spotted by Sloopin’. WEST LOOP— Korean food fans have been waiting patiently for news on H Mart, the Korean grocer with quick-serve restaurants inside. Last year, H Mart (which also has a location in suburban Niles) announced it will open at 722 W. Jackson Boulevard. The spot could open either Christmas or New Year's day, according to DNAinfo. BERWYN— City Barbecue, a chain with 37 locations in Georgia, Kentucky, North Carolina, Indiana, and Ohio, has announced the opening of its first Illinois restaurant. It should open on October 30 at 7108 W. Cermak Road, according to a rep.
ROSEMONT— Next month, the city of Rosemont will see the reopening of a remodeled sports bar open from Kings Entertainment (the company also runs the bowling alley at the NEWCITY development in Lincoln Park). It’s called The Draft Room. The bar features a 14-foot LED TV for sports watching and 40 draft beers. The restaurant first opened in 2012 inside Rosemont’s MB Financial Park. BUCKTOWN— Brookyln’s Royal Palm Shuffleboard Club could open its Chicago location either in late January or early February in Bucktown at 1760 N. Milwaukee Ave., according to its owners. They’re considering launching an online fundraising campaign to offer discounts for anyone interested in joining a shuffleboard league. Check their social media accounts for more info. LAKEVIEW— The area near the CTA’s Belmont Stop for Brown/Red/Purple Lines is about to be redeveloped. New tenants will include another Devil Dawgs and the first Chicago coffeeshop for Milwaukee-based Stone Creek Coffee, reported DNAinfo. THE LOOP— Gibsons Italia, the new Italian steakhouse with a retractable roof at River Point, 444 W. Lake St., should open on Oct. 18, if all goes well, according to a rep. The date hasn’t been finalized. This restaurant is the first downtown spot from Gibsons in 12 years. LINCOLN PARK— A new restaurant featuring Eastern European dumplings and other Russian delights should open next week at 2468 N. Clark St. It’s called Hugo’s Pelmeni and they’re takingover a space that’s housed an ice cream parlor and fro-yo spot. Its Facebook page and website don’t give away anything more about the menu. LINCOLN PARK— Off Color Brewing’s Lincoln Park taproom could open at the end of the month, said co-founder John Laffer. Mousetrap has room for 150 seats at 1460 N. Kingsbury St. TheReader spoke with Off Color staff and explored how the new facility will affect the brewery’s production. LOGAN SQUARE— Jet Man will bring his take on Detroit-style pizza to Logan Square as Jet’s Pizza is taking over a former laundromat at 3510 W. Armitage Ave., reported DNAinfo. THE LOOP— D.C. sandwich chain Taylor Gourmet is hiring. The chain hopes to open its first Chicago shop sometime this month at 1 N. Dearborn St. THE LOOP— Big Shoulders Coffee should open a shop on Oct. 30 at 213 W. Lake St. Management posted an announcement video on Facebook. OLD IRVING PARK— Chicago Taco Authority, the new taco spot replacing Berrista Coffee at 4219 W. Irving Park Road, posted photos on Facebook. Check out the images below. OLD TOWN/WEST LOOP— Here’s news on Brendan Sodikoff’s burger baby, Small Cheval. TheTribune reported the West Loop location could open by the end of the month at 150 N. Riverside Plaza. The Old Town spot at 1345 N. Wells St. could open in December. SOUTH LOOP— The former Ameritalia has a new tenant. Ko Me Japanese Eatery (or is it Kome?) will serve ramen, poke bowls, and more. Sloopin’ first noticed signs at 1303 S. Michigan Ave.
AURORA/SCHAUMBURG— America’s Dog & Burger is expanding in the suburbs, reported The Daily Herald. Ownership hasn’t released the exact locations, but they’re looking at spots in Aurora and Schaumburg and expect to open early next year. OAK PARK— Lake Street Brewing is opening a brewpub in early 2018, according to Oak Leaves.Owners just received their liquor license for 1 Lake St.
DOWNTOWN— The empty central Chicago Post Office Building at 433 W. Van Buren is drawing development interest once more, as reported earlier this month by Curbed Chicago. The Tribunenow reports a $600 million plan that includes restaurants. GOLD COAST— Booth One, Lettuce Entertain You Enterprises’ take over of The Pump Room, is hiring for the restaurant at 1301 N. State Parkway. Check out the ads over here. They’re targeting a late fall open. LOGAN SQUARE— Bo Fowler keeps on plugging away, as the owner/chef of Owen & Engine and Fat Willy’s Rib Shack in Logan Square said her third restaurant, Bixi Brewery, should now open in January at 2515 N. Milwaukee Ave. The project first surfaced in 2015. THE LOOP— Wells St. Market, the new food hall at 205 W. Wacker Dr., has applied for a liquor license. That’s the office building food hall from the owner of Firecakes Donuts. PORTAGE PARK— Prominente Mexicana will serve Mexican and American food at 4929 W. Irving Park Road, reported the Tribune. HYDE PARK— Jolly Pumpkin Artisan Ale’s Chicago brewpub now has an opening date. A Facebook post revealed a grand opening should happen on Oct. 19 at 1504 E. Harper Court. They’ve also added “pizzeria” to their name. Of course, a “grand” opening could mean they’ll open a little bit earlier so locals can sample the space. HYDE PARK— It didn’t take long, as Jared Leonard is almost ready to open his second BBQ Supply Co. He’s taken over the former Yusho space at 1301 E. 53rd St. It could happen the second week of October. PORTAGE PARK— The comeback is almost complete in Portage Park. Fischman Liquors has applied for its liquor license. That’s the Jefferson Park packaged goods spot that closed. The owners have big plans for a new location with a restaurant at 4050 N. Milwaukee Ave.
LINCOLN SQUARE— Nick’s Pizza & Pub, a favorite for tavern-style pizza in Elgin and Crystal Lake, should open a Chicago location next month at 2434 W. Montrose Ave., according to a news release. RIVER NORTH— Pacific Standard Time, the restaurant from Publican chef Cosmo Goss and Nico Osteria chef Erling Wu-Bower, should open soon as they’ve just applied for a liquor license, according to city records. It’s looking like November at 151 W. Erie St.
ROGERS PARK/LOYOLA— A trio of new spots are opening near Loyola University near the CTA’s Loyola Station on North Sheridan Road. They’re headlined by the first Chicago location forRaising Cane’s Chicken Fingers. The Louisiana-based chain arrived in the area in 2016 in Oak Lawn. There’s also an Argo Tea and third restaurant called Onward, reported the Loyola Phoenix, the school’s student newspaper. An investor in Onward, Mike Olszewski, is an investor in chef Curtis Duffy’s three-Michelin-star restaurant, Grace. He told DNAinfo that they’re shooting for a March opening inside the Hampton Inn hotel. SOUTH LOOP— Asian Cajun, which has a location in Lincoln Park, is expanding to the South Loop. Sloopin’ snapped a photo of signage at 2113 S. State St.
SOUTH LOOP— A new mini chain with three suburban locations, Taco Madre, is coming to 823 S. State St. Sloopin’, again, snapped a photo. SOUTH SHORE— A Creole restaurant is opening at 7054 S. Jeffry Blvd. It’s part of an entertainment complex that will include a movie theater, according to DNAinfo. The restaurant has a working name, Odessa’s. UKRAINIAN VILLAGE— The former Bar DeVille space has been taken over by a Lincoln Park bar owner. Scott McCorkle is calling his new bar Damen Tavern. He owns Halligan and Hook & Ladder along Lincoln Avenue near the former site of Children’s Memorial Hospital. DNAinfo reported that the new bar will open on Sunday at 701 N. Damen Ave. Meanwhile, the owners of Bar DeVille could open a new location this spring, according to a spokeswoman. UPTOWN— Oct. 4 is opening day for Ridman’s Coffee, a new coffeehouse at 4756 N. Clark St., reported DNAinfo. Bow Truss had targeted the space before the legal and fiscal problems surfaced. UPTOWN— Jared Leonard (Budlong, BBQ Supply Co.) is keeping busy. Crews should start construction on Beacon St. Market, the new mini-food hall at 1325 W. Wilson Ave. There’s still no word on an opening date. EVERGREEN PARK— Krispy Kreme continues its comeback. It’ll open on Oct. 10 at 9150 S. Western Ave., according to a news release. NAPERVILLE— Pete Miller’s Steakhouse is coming to DuPage County. It’s replacing the former Tommy Nevin’s at 3032 English Row, according to a news release. It should open in October. There’s a Pete Miller’s in Evanston which is getting a remodel. ORLAND PARK— A south suburban shopping mall will be getting plenty of meats. Texas de Brazil should open next year at Orland Square, according to a news release.